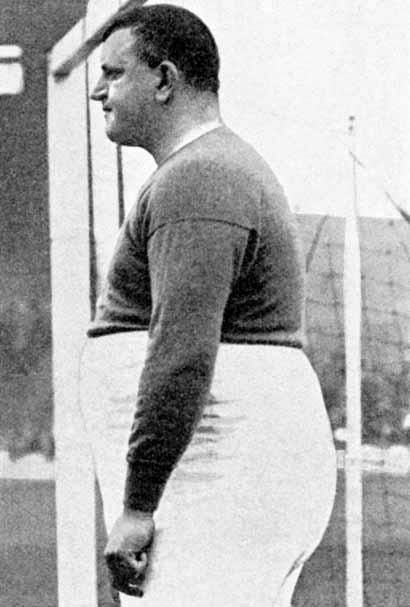 Perhaps the first, and still among the most famous, of the character-goalkeepers was William Foulkes, known most often as ‘Fatty’ for obvious reasons, but also by the much kinder nickname of ‘The Colossus’, who graced the game across two centuries. And whilst I’ll make no claims about the mental health of the man whose star shone brightly during the end of the Victorian and beginning of the Edwardian eras, he certainly had many of those traits that make the men who guard the last line of defence different. Many reports, both from the time and since, reported his name as Foulke but it appears clear from his headstone, pictured below, that there was an ‘s’ at the end. For the purposes of of this article I have kept the name ‘Foulke’ in contemporary reports. Early days at Sheffield United. Almost svelte! 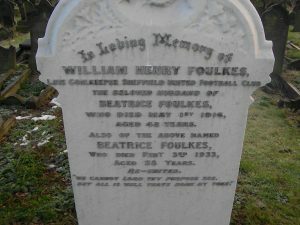 Within a year, Foulkes’s exploits had earned him a place in the professional ranks with Sheffield United, one of the biggest clubs in the country at the time, forking out £20 to sign him. On September 1, 1894, the keeper made his debut for his new club, replacing the legendary Arthur Wharton between the posts. He went on to play in 29 of the 30 games that season and helped his team to a 6th-place finish. With his team regularly challenging at the top of the table, Foulkes earned international recognition in 1897 when capped against Wales in a 4-0 win. This was to prove to be his only cap however as he could not dislodge the incumbent ‘keeper Jack Robinson, with many at the FA apparently not pleased with some of Foulkes’s antics. A report in the Sheffield Daily Telegraph highlighted the problem. 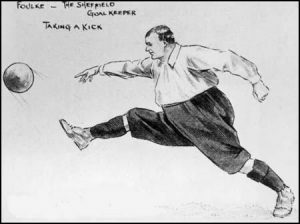 “It is a pity that Foulke cannot curb the habit of pulling down the crossbar,” the report stated, “which on Saturday ended in his breaking it in two. 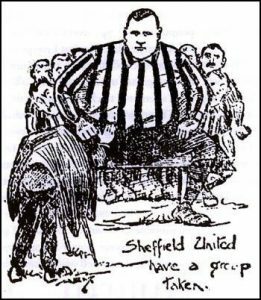 In 1897-98, Sheffield United, led by Ernest ‘Nudger’ Needham captured the championship, and finished with the best defensive record. Foulkes missed just one game and was described by many as ‘the best goalkeeper in the world.’ Forwards tried to intimidate him. According to reports, George Allan of Liverpool ‘charged him’ in one match and the big man; ‘losing his temper, seized him by the leg and turned him upside down holding his head in the mud’. Liverpool were awarded a penalty from which they scored and won the match. 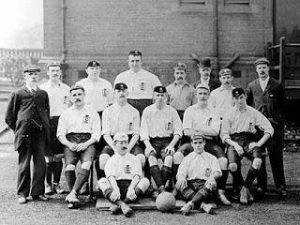 Another Cup Final was reached in 1901 but United were undone by Tottenham Hotspur 3-1 in a replay, after the first match finished all square at 2-2. Foulkes’s performances, even in those defeats, was of the usual high standard. Reports suggested that it was the big man’s heroics that earned the second match and kept the score down to three in the replay. 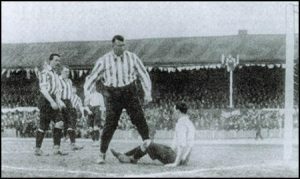 In 1902, United and Foulkes reached another FA Cup Final with Southampton the opponents. The match, and the ensuing replay, might well have contained the big man’s greatest performances, as well as a defining moment. With two minutes to play, Southampton knocked the ball upfield and it fell to Harry Wood who had been tying his bootlaces and was in an offside position. When the ball came his way, Wood straightened up and ran on to score. The referee, Mr Kirkham consulted his linesman and they concluded that the ball had struck a United defender playing Wood onside. After the match Foulkes went looking for Kirkham, ‘in his birthday suit.’ Linesman J. T. Howcroft later recalled; “I saw F. J. Wall (secretary of the FA) pleading with him to rejoin his colleagues. But Bill was out for blood and I shouted to Mr. Kirkham to lock his cubicle door. He didn’t need telling twice. But what a sight! The replay took place a week later and United, with Foulkes described as ‘invincible’ by the Athletic News, running out worthy 2-1 winners. ‘The Colossus’ had his second FA Cup winners medal. Over the following seasons, his ever-increasing weight was starting to affect Foulkes’s play. Although his size and girth proved a help in some situations, such as when Bolton forward Stokes ran through on goal but, as a newspaper report said; ‘the mountain of flesh which is posed by Foulke hove in sight, and appeared to paralyse the little Wanderer, who simply shot into the hands of the leviathan.’ But the ever-expanding girth made it increasingly difficult to reach low shots, a problem opposing forwards took advantage of. United fans started to berate him for his performances and he began losing some of his immense popularity. 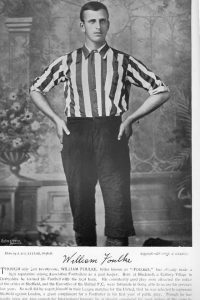 In 1905, United decided that, if he wanted to remain with the club, Foulkes would need to take a pay cut. He refused and was transferred to League newcomers Chelsea for £50. It was reported that Chelsea, newly formed and in need of personalities, offered him the maximum wage. So he agreed to move to London and was immediately made captain. In his first season at Stamford Bridge, Bill’s form was outstanding, he saved 10 penalties and his team finished 3rd in the second division. To draw more attention to his size Chelsea placed two small boys behind the goal. The boys started to collect the ball when it went out of play, and ball boys were ‘born’. His prowess at saving penalties came to the fore during his time in London. In one match against Burton United he saved two from the same player. When berated by a teammate and asked why he didn’t put the ball on either side of the ‘keeper the man who missed simply stated; “I couldn’t, there was no room”. Another tale from his time at Stamford Bridge sees the team travel to an away match. Foulkes was detached from his teammates at the railway station (including the one who had the tickets) and on informing a pair of ticket collectors who he was, was promptly laughed at. He picked both up, tucked one under each arm and carried them to the Station Master’s office to confirm his identity. 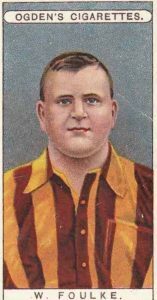 He spent a single season in London before moving back to Yorkshire and joining Bradford City in 1906, again for a transfer fee of £50. 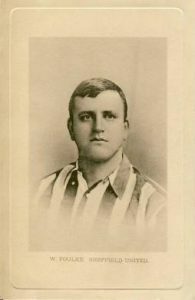 He was still performing well, with the local ‘Daily Argus’ newspaper stating that; ‘the mighty goalkeeper is doing a great deal in the direction of inspiring confidence in the team.’ But in November 1907, with his weight a continuing problem, he decided enough was enough and retired from first-class football. Moving back to Sheffield, Foulkes had a shop in the city and also took over the ‘Duke’ public house. But he was soon accused of being involved in illegal betting, was fined £25 and lost his publican’s license. Foulkes died in May 1916 at the age of just 42, with the official cause of death given as “cirrhosis”, an illness often brought on by excessive alcohol use. Reports at the time stated that he had set up a ‘Beat the Goalie’ sideshow on Blackpool seafront with players charged 1d a shot and given 3d if they scored. He caught a chill while performing and this led to his sad, and early demise. Over 100 years after his death, memories of Foulkes linger. Mitchell and Kenyon footage showing the man in action stands testament to his size. His sporting prowess is documented in record books, and his uniqueness and personality shines through in some of the stories and quotes recounted above. And it’s surely fair to say that there is, and always will be, ‘Only one Fatty Foulkes’.